In my post from yesterday I mentioned the new garden hose. GMan unpacked and set it up today. Here it is. The hose retracts onto the reel inside the case which swivels on the black spindle. Here is another view with the hose slightly extended. 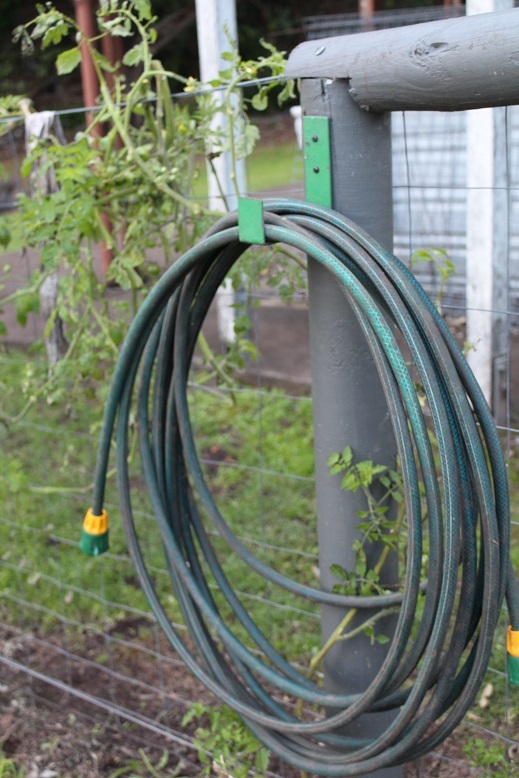 The 30 metre hose extends from the existing tap to the vegetable garden area. We do need more hose to reach the blueberries and the yet-to-be-built beds on the far side. 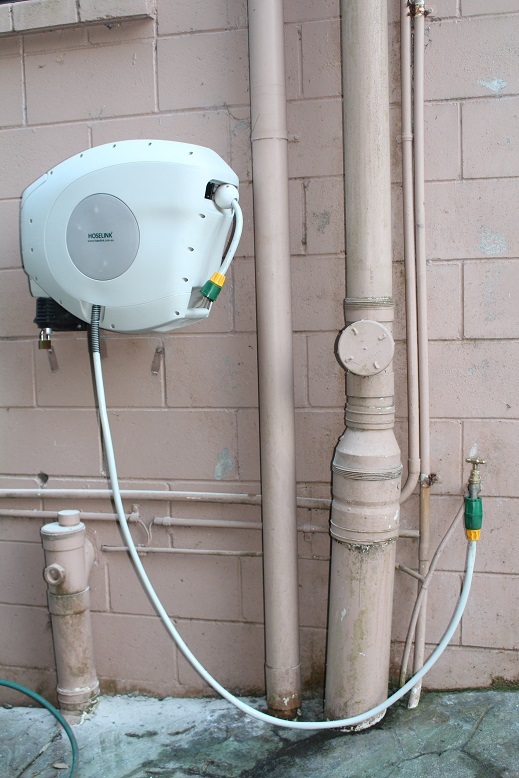 We put some of the new fittings onto one of the old hoses and hung it inside the garden area. That way we can extend the new hose, attach the extra bit and we can water the whole of the vegetable garden area with ease. GMan put this bracket on one of the posts to store the extra hose. The bracket was one that had come from my father and proved to be perfect for our needs. I have really neglected the garden for several weeks but nevertheless we still have things growing. I weeded the flower garden that I made a few months ago and found that I even had some flowers. 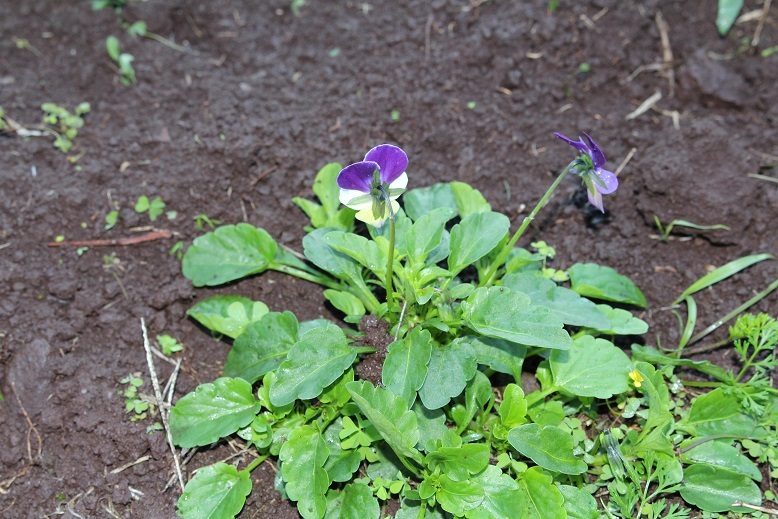 These heartsease had managed to grow from seed and thrive among the weeds. I have weeded the bed and transplanted some so that there is now a border of them in front of the sweet peas. 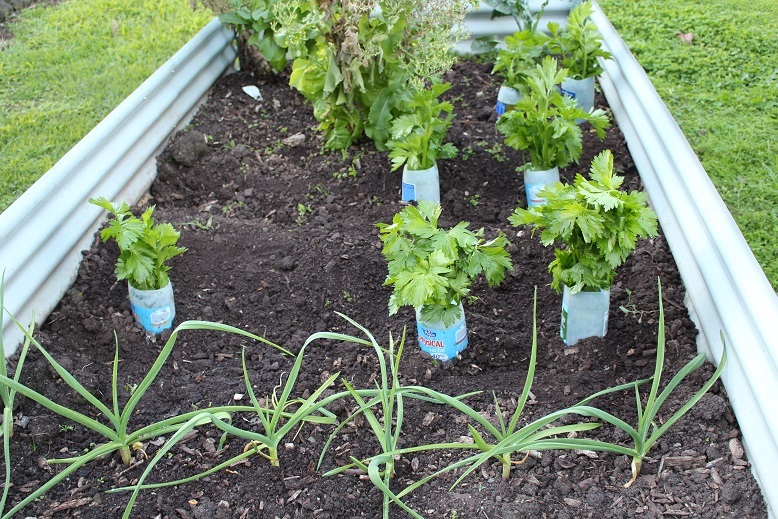 Finally, I wanted to show you the garlic that I have growing and also the celery which is now ensconced in cut-down milk bottles to encourage the stems to grow upright in a bunch rather than spreading out everywhere. I hope you have had a great weekend and that the weather has been kind enough to get outdoors. Our vegetable garden area has been a work in progress for several years and continues to be so. However, I feel as though we have taken a giant leap forward today. 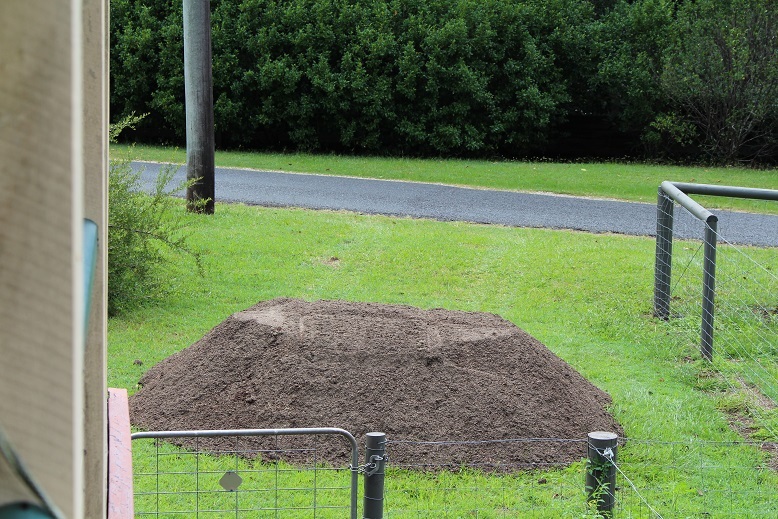 We had a load of soil delivered yesterday. This was the view of the area yesterday. 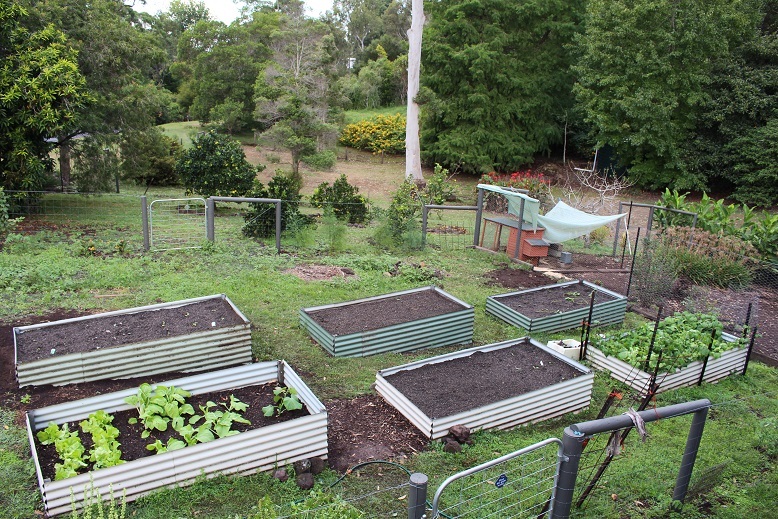 The three beds in the foreground have been established for some time and the top one currently has lettuce and bok choy and the bottom one has beans and bok choy while the middle one is empty after having cleared out the remnants of tomato and cucumber plants. 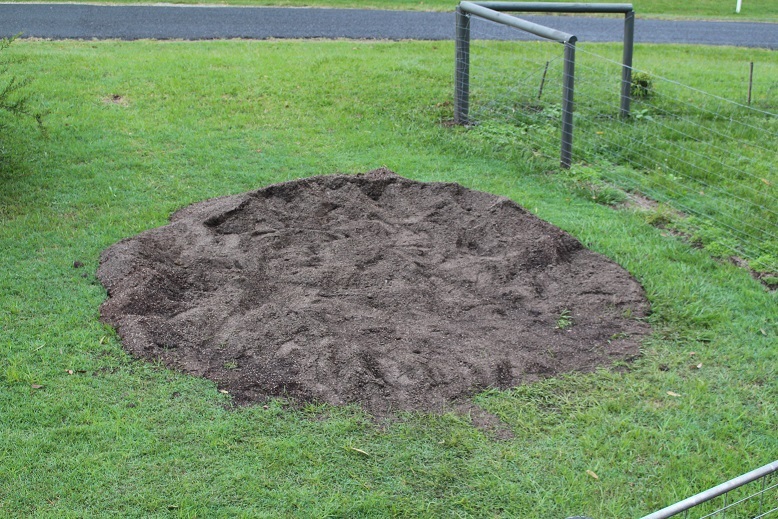 This bed needs topping up with additional soil. In the background towards the chicken coop is a clump of sweet potato growing in a small cut-down rainwater tank. Of course, it has overflowed and is growing across the ground towards the fence. 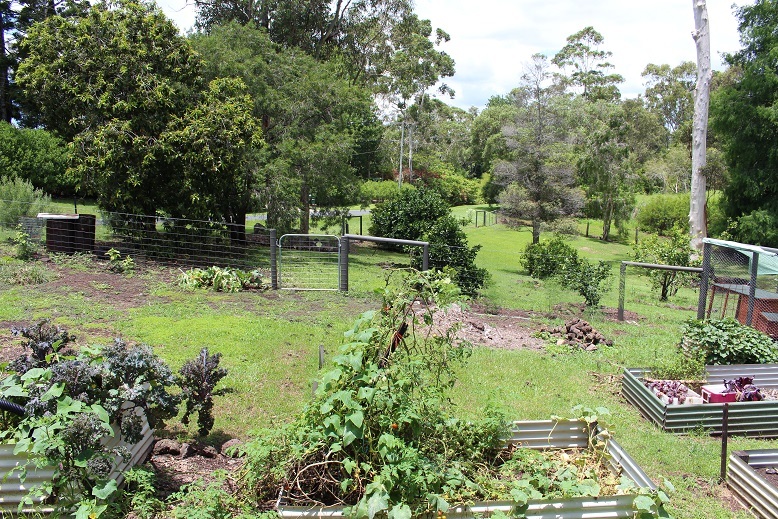 The lower two beds in the background have a small amount of leaf litter and mulch but are yet to be used. 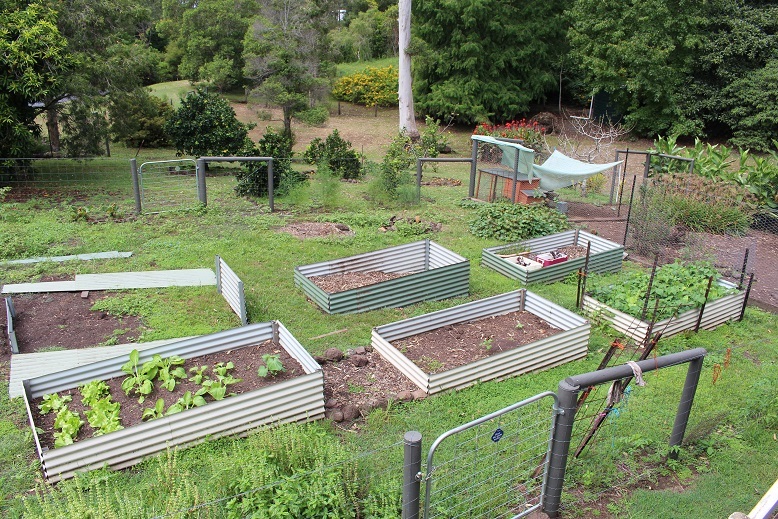 At the top of the second row is the sixth raised bed partially built. We still need to finish cutting the iron to size and attach the sides. We started early today and moved the soil to fill the completed beds. This is all that was left this afternoon when we had finished. Then it was time to add the sides to the final bed. Remember the sweet potato I pointed out in the earlier photo? We dug it all up and harvested a bucketful of decent sized sweet potatoes. There were lots of small ones but we have sacrificed them for the long-term plan. 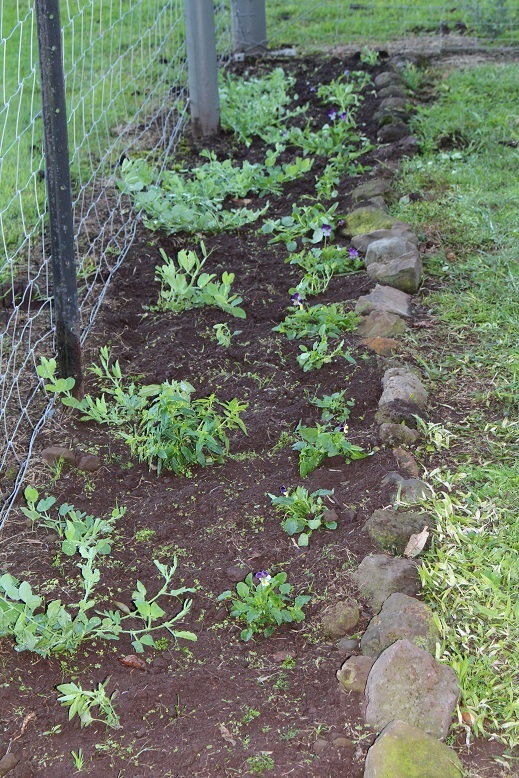 I planted several pieces of vine that had significant root growth as well as numerous potatoes that were shooting. These all went into the bottom bed. The remainder of the soil from where the sweet potatoes were growing went into the base of the last bed. We then salvaged several wheelbarrow loads of leaf mulch from behind the rainwater tank and finally added the garden soil. Here are the 6 raised beds filled with soil and I have planted some cabbage, broccoli, cauliflower and kale seedlings that we bought last weekend. There is still plenty of space so I am planning to plant some seeds as well. The other thing I did today was to trim and tidy up the basil which has gone completely rampant. I even found some new plants so I potted some and planted others in the garden bed. I have tied the clumps of basil up to the fence to stop them spreading all over the ground. The basil are in the foreground of the photo below. 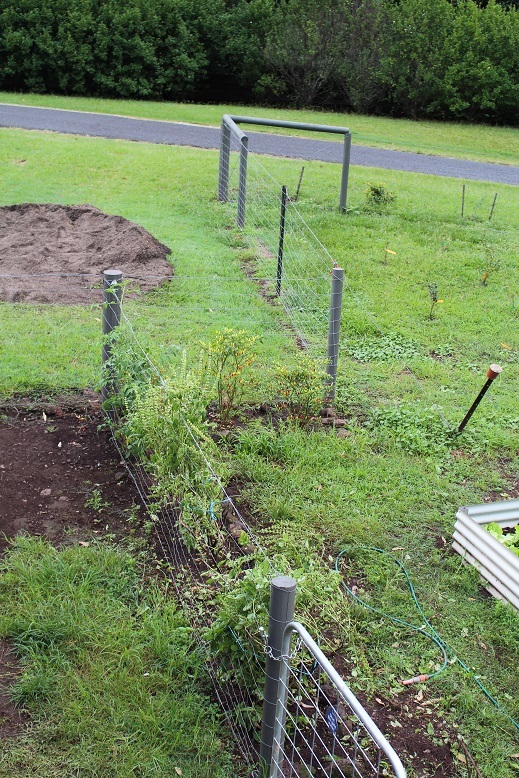 Tomorrow, I am hoping to dig another garden bed along the fenceline as it heads towards the front of our property. The plan is to plant flowers in that bed. I have bought sweet pea seeds and intend to grow them using the fence as a trellis. but more about that another day. It is the height of summer here and over the past 4 weeks we have been blessed with warm to hot days (27 – 32C) and intermittent showers and storms. The rainfall has been over 100mm in the last fortnight. Your can almost hear the vegetation growing and everything is green and lush. Unfortunately, the weeds are loving the weather and thriving as much as the plants that are supposed to be growing. Since we live on an acreage, we are never going to have a pristine garden but I do prefer not to have it overgrown with weeds so it seems to be a never-ending battle to keep them at bay. The Duke tends to use a combination of whipper-snippering, glyphosate and simply pulling them out. The glyphosate is banned from anywhere near the vegetable garden but unfortunately it has been a necessary evil on other parts of the block. I recently received some information from my friend, S, over at My Life is A Balancing Act. Although she hasn’t posted this on her blog, I think it is worthy of a mention. Mix well. Spray on weeds to kill them. 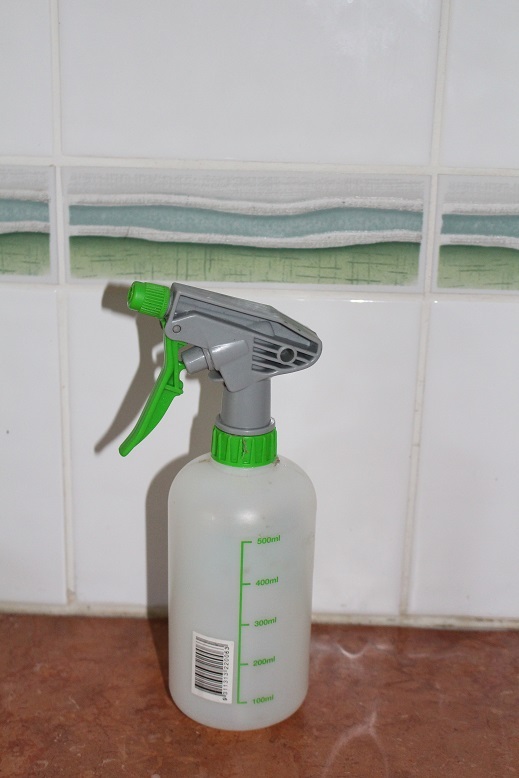 This is a very effective weed spray so only spray it on the things you want to kill. It is excellent for weeding paths and pavers and along the edges of garden beds. It sounds easy and even piqued the interest of The Duke. Before I rush out and buy a bulk quantity of vinegar I decided to test it out. There is no shortage of places to try. 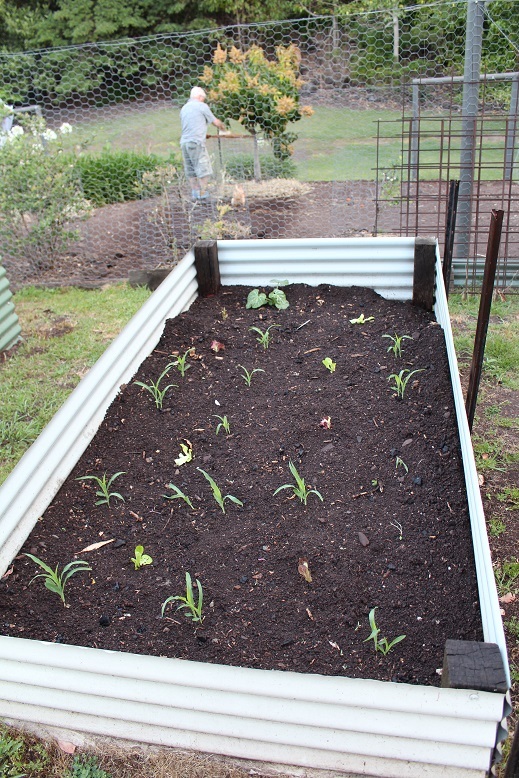 This is a patch of the weeds in what can best be described as the future garden bed in front of the verandah. 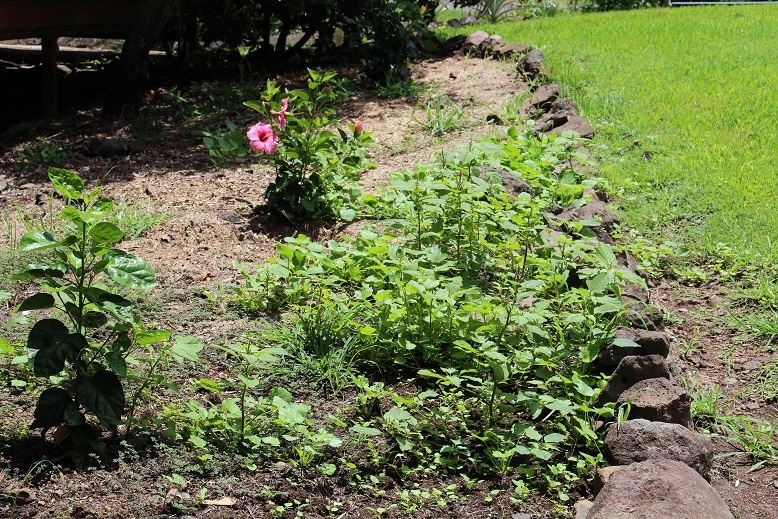 We have planted several hibiscus shrubs that are the beginning of the new plantings and there are some old shrubs which will need to be removed but there is a lot of bare earth which the weeds are really enjoying! I had 1 litre of white vinegar so made up a 1/4 mix of the recipe and filled a small spray bottle. I sprayed weeds until I had used up all of my mix so now it is just a matter of waiting. According to S, I should see wilted and dying weeds within 24 – 48 hours. I will be back on Saturday with an update on this project. If it shows signs of being successful, I will be looking for somewhere that I can buy a bulk quantity of vinegar and also buying a backpack sprayer as S suggested because my hand is exhausted from just spraying a small area of weeds. After spending my weekdays in the office there is nothing I enjoy more than spending time in the garden on the weekend. I will start with what we actually did last weekend. We finally finished building this raised garden bed. There are now 4 beds complete and we eventually plan to have 9 of them. The cardboard is a large carton that was the packaging from the refrigerator we bought last year. We always keep any large pieces of cardboard as it makes a great base for the beds and is very effective at smothering the underlying grass before eventually breaking down. 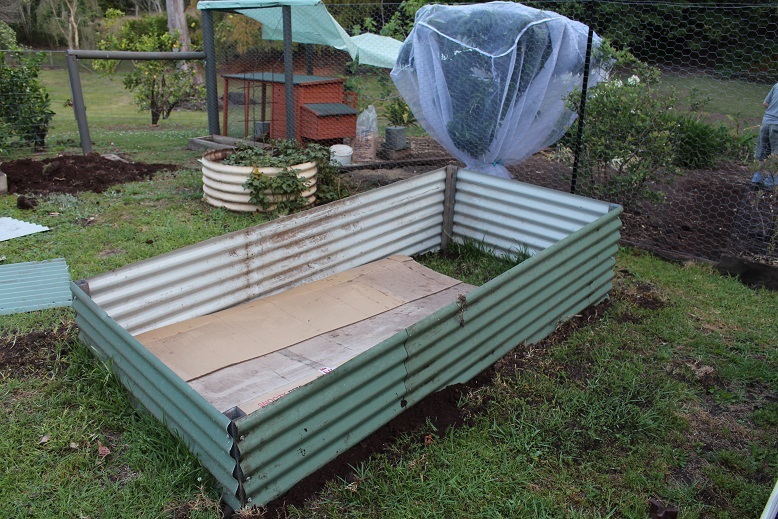 I will cover the remainder of the base with some more cardboard before gradually filling the bed with a combination of fallen leaves, mulch, compost and grass clippings which will, over time, become rich soil. It will all be sourced from our block. 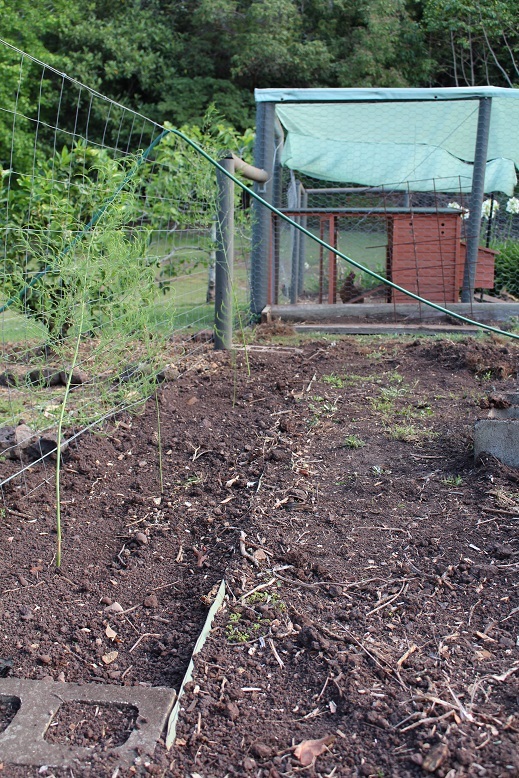 We also created a bed for the asparagus. Since asparagus grows very vigorously and spreads, we wanted to make sure that we are able to contain it. 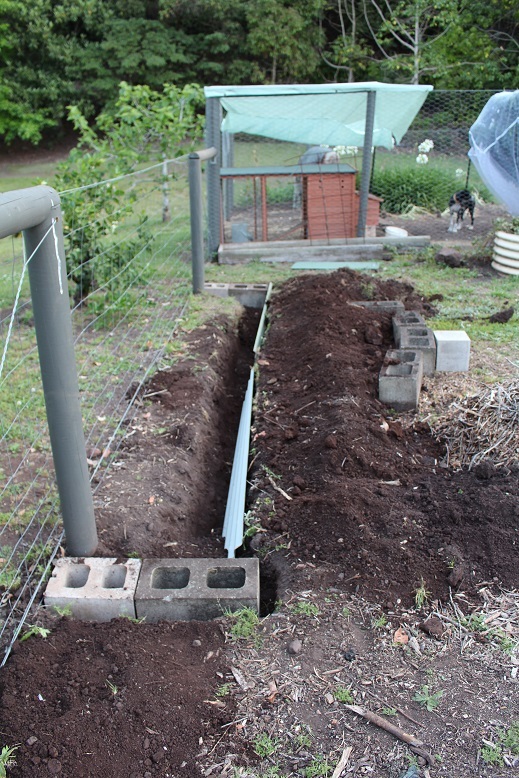 The Duke dug a trench and buried some offcuts of Colorbond steel to a depth of 320mm to form the border of the asparagus bed. Here is the work in progress. This is what it looked like once we had finished and planted the asparagus. The lettuce seeds I planted a couple of weeks ago have not put in an appearance so yesterday I bought some seedlings and planted them in between the corn which is growing nicely. The other thing we did today was to start to tidy up around the citrus trees. 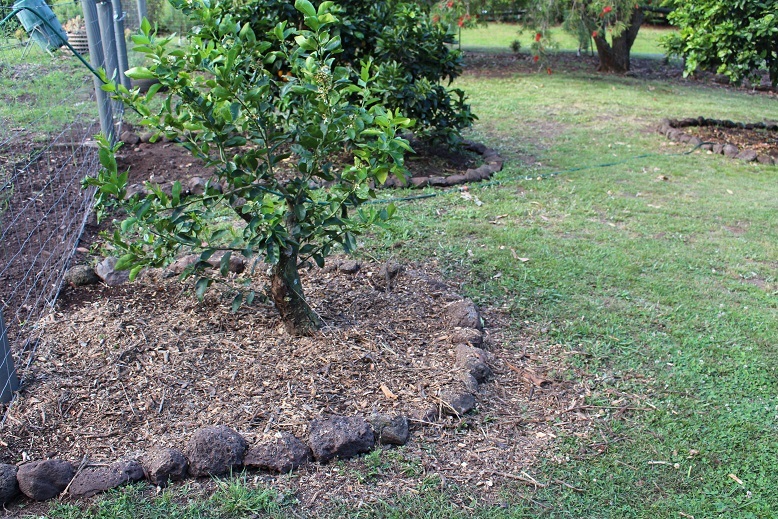 Here is the lime tree with a new border of rocks and some mulch. You can the orange tree behind it and grapefruit to the far right which have been bordered with rocks and now I just need to finish weeding them and put the mulch down. 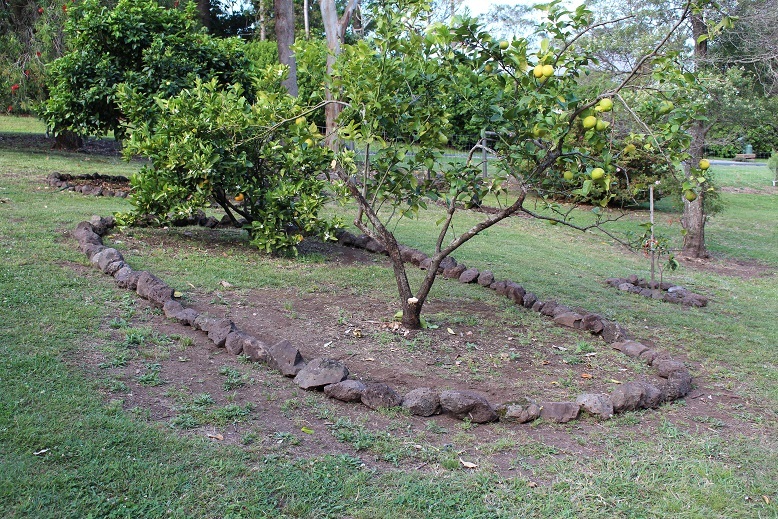 We decided to border the other orange tree and the lemon tree in one large area. The Duke collected up the rocks from down the back near the water tanks. We have an abundance of volcanic rocks on the property so it is good to be able to use them. I have planted more seeds – most expired by several years – so will see how they go. Lettuce, radish, chilli, tomato and bok choy all went in today. I am determined to grow more of our own food and am hopeful of greater success now that the vegetable patch is completely fenced. On Thursday evening there was a card in our mailbox advising that there was a large parcel at the Post Office for us to collect. We collected the box early on Friday morning before we went to work. It was our fruit trees that we ordered online from Daley’s Nursery. 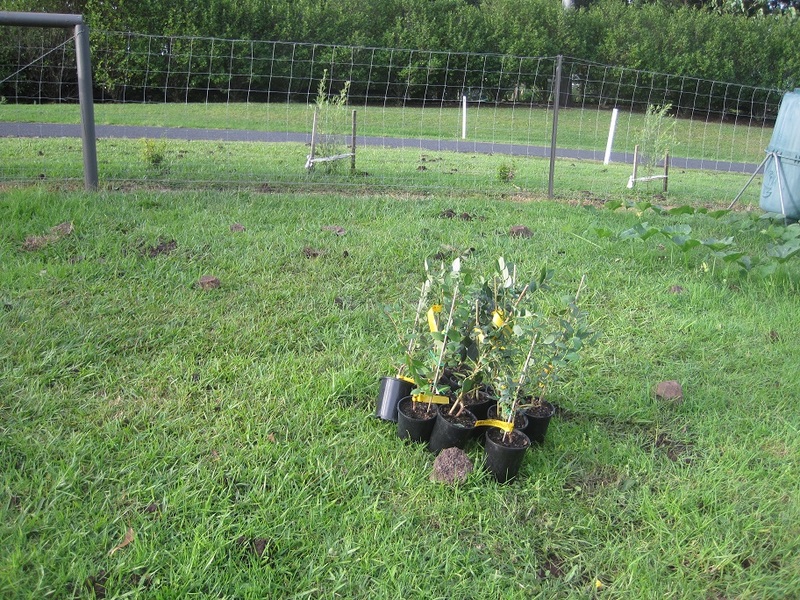 We ordered 12 blueberry bushes and a passionfruit vine. Here is the box after I had slit one side open (as suggested in the attached instructions). 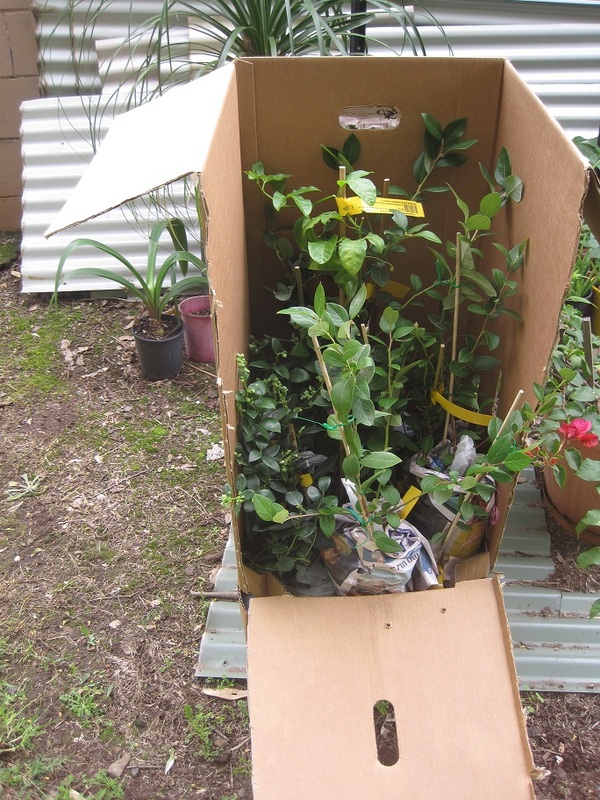 The plants were well-packed and in excellent condition. Once again, we followed the directions and removed all of the wrapping and put them out in full sun. We watered them well and have placed them in the area where they will be planted – hopefully tomorrow. It may be a bit difficult to see in the photo but I had already placed rocks to mark where we are going to plant them so it will be a relatively simple matter of digging the holes. The ground is quite soft as we have had some rain. Blueberries thrive in a slightly acidic soil. I have never actually tested the pH of our soil but the other indicator is that azaleas and camellias grow really well in our area and they like very similar conditions. We have four other blueberry shrubs which are in the area which is now the chicken run. You can read about them in this previous post. We did not give them as much care as they probably needed but we still managed to harvest about 1.5kg of berries this summer. That was predominantly from 2 shrubs. We have now pruned them quite hard and mulched them thoroughly. 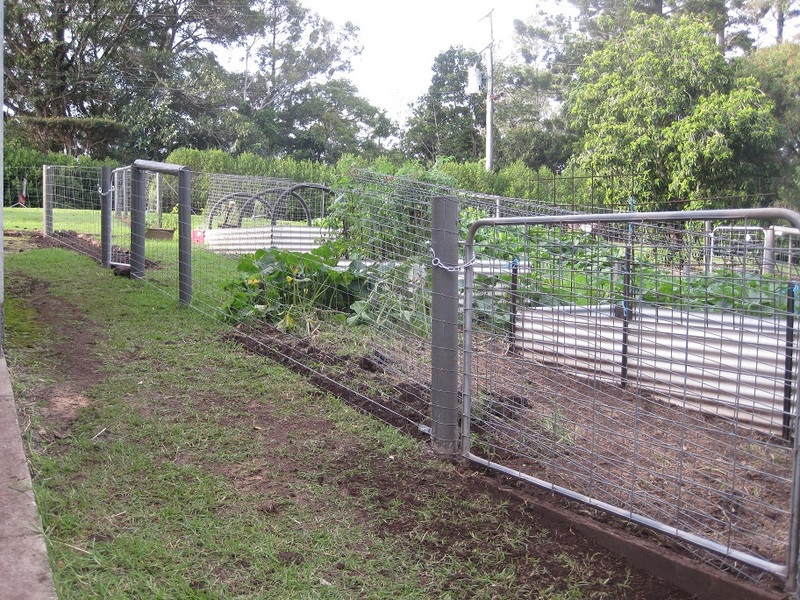 The other exciting news is that we have completely finished fencing the vegetable garden area. As well as the completed fencing you may also be able to see the black hoops over the garden bed in the distance. This is some large poly pipe which I am planning to use as a frame for some exclusion netting to keep the white cabbage moth off the broccoli, kale, cabbages and cauliflower. I am looking at buying the vege netting from Green Harvest. We are fortunate that this business is located in Maleny so we are able to place our order online and then pick it up in person. The chickens are rather unhappy that they are now permanently excluded from the garden area and all of the freshly dug soil and earthworms. Sustainable House Day 2013 is an opportunity to check out a variety of dwellings in your area with sustainable features. You can check out the website here. We have chosen to be involved and are included in this list. If you are in the area and would like to see ‘The Castle’ in real life please come and say hello. 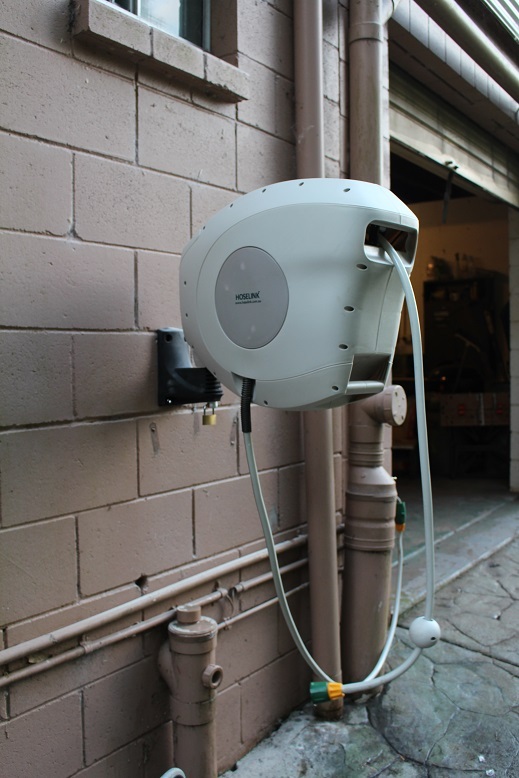 I am looking forward to being able to show people some of the features of our house and garden which reduce our impact on the environment and invariably save us money at the same time.